The Steller Sea Lion, a pinniped native to Alaska’s waters, has declined in numbers quite dramatically since the 1970’s. Unfortunately, it is hard to pinpoint the reasons for their decline. Scientists at the Department of Biological Sciences at the University of Alaska at Anchorage have a number of possible hypotheses. For example, the decrease might be related to disease, climate change, food availability, or water contamination. Another complication is that juveniles, the young sea lions, may not be surviving as well as in the past. Steller Sea Lion pups are generally born as a single baby to their mother in late June or early July. They stay with their mother and are nursed for one to two years, and then they must make it on their own. 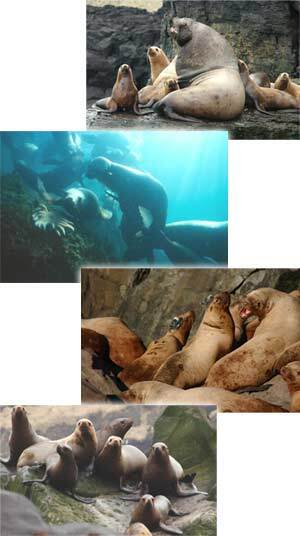 Steller Sea Lions eat a varied diet of cod, pollock, herring, rockfish, and other fish species, as well as invertebrates such as octopus and squid. These animals are not too picky. Their diet changes based on the area. Pups begin to forage, or find food, while still living with their mother, but pretty soon they are on their own! Some sea lions leave their mother at one year old, while others as late as two years; scientists are not sure why or how this might affect the survival of the young animals. Dr. Jennifer Burns and her team at the Department of Biological Sciences at the University of Alaska in Anchorage, are particularly interested in the foraging behavior of these juvenile sea lions. Using lightweight satellite tags glued to the head of the animals, the team can learn a lot about their behavior. The tags collect data about the sea lions’ locations, the time spent in the water, and the length and depth of their dives. 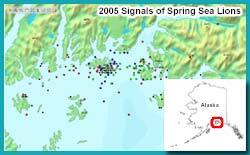 Since they are air-breathing mammals, they must frequently “pop out” at the surface, and at these times, barring poor weather or sea conditions, the tag transmits data to a satellite. The team then analyzes the data to look for patterns. Similar dives at similar times each day may indicate that the sea lions are foraging. The research team has found that Steller Sea Lion pups, those younger than one year old, only dive for about three to four minutes. As they get older and larger, their lung capacity increases and by the time they are over a year old, they dive for up to seven minutes. By learning how and where the animals find food, it is hoped we can better know how to protect them and prevent further decline of the species. Dr. Burns’s team has found that the animals use some of the many islands in the area to haul out onto land to rest and breed, but other islands not at all. They have seen that many of animals use deep water fjord areas to forage for food, and choose islands nearest to these areas. Because Steller Sea Lions are classified as Endangered Species, they are well-protected under federal law. No one may bother or kill these animals. Certain spots in their foraging areas have been declared no fishing zones. Dr. Burns stresses the importance of making sure that regulations are helpful to protecting the animals, but also that restrictions are appropriate to the very important fishing industry in the area. The research is still ongoing, and there is a lot to learn. While Dr. Burns’s research focus is on foraging behavior, juvenile survivorship and feeding may not be the only reason for the decline of the species. “We don’t have a smoking gun on why there’s been such a big decline,” Dr. Burns reminds us. Her University of Alaska team is working to find the cause, and to help Steller Sea Lion populations to recover.